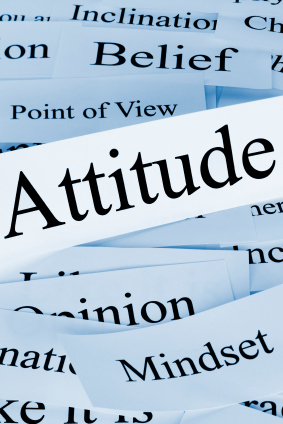 Your life is pretty much a reflection of your attitude to it, so if your life isn’t going as well as you would like, it’s possibly time to check your attitude. Attitude determines how we view the world; so a bad attitude will make you see the problems in any situation, including ones that don’t exist. Have you noticed than when you feel good, the world around you seems good too? Conversely, when you feel low or in a bad mood, everything seems to go wrong with your day. This shows you how important your attitude is, in making your life better for yourself. No one can give you a bad attitude; you do that all by yourself. Choose to be a ‘glass half full’ person rather than one who sees the ‘glass half empty’. Look for the positive and you will find life treats you much better. You probably already know how draining it can be when you are in the company of a gloomy ‘half empty’ person; how much better do you feel when you hang out with someone who looks at the brighter side of life? You choose your attitude, so make sure you choose a good one. Life is going to throw all sorts of problems and challenges at you; how you deal with them will determine the quality of your life. You can be a victim to life, taking a passive approach and complaining about how “it’s just not fair”; and think it’s always someone else’s fault and feel sorry for yourself. Or you could choose to have a can-do attitude, to view problems as part of life and simply challenges to be overcome, and take responsibility for your own life. Choose your attitude as soon as you wake up in the morning. Decide that it’s going to be a good day and that you will be able to handle whatever life throws at you. Even if you know there is going to be a challenge in your day, say to yourself “I know that is going to be hard but I will be able to manage it.” On a particularly rough day, you might have to check your attitude and adjust it several times, to make sure your attitude stays good. To make your life better, avoid staying in your safe zone. Always playing it safe isn’t going to give you the life you want. All the best things in life are outside your comfort zone, so that’s where you need to be. Be uncomfortable, take a risk, act out of character and see where it takes you. Adopt an ‘I can and I will’ attitude and create the life you really want. If you tell yourself ‘I can’t’ often enough, you will start to believe it. Reverse this trend and start to tell yourself that you can. I love this quote “Your faith can move mountains and your doubt can create them.” I think that about sums it up! Be careful what you say to yourself when you’re not watching. This is called ‘self talk’ and can be the biggest enemy to a good attitude. Your subconscious believes whatever you tell it, whether it’s true or false, so make sure what you are telling yourself is leading you towards the life you want. If you constantly think that you’re not good enough, or you won’t ever have enough money, or you hate your job, you’re making it really difficult to maintain the sort of attitude that is going to make your life better. Lighten up on yourself, give yourself a break and start to see the bright side of life. An attitude of tolerance and forgiveness allows you to accept what happens and then move on. Holding grudges only hurts you; as does being judgmental and critical. Accept people for who they are, forgive yourself for being human and understand that things happen; it doesn’t have to be anyone’s fault. With acceptance comes the ability to move forward with your life, the way you want it to be. Complaining doesn’t help anyone and only attracts more things to complain about to your life. Being positive is perhaps the most useful attitude you can have. When you have a positive attitude, everything seems much brighter. Positive people attract positive people so you get to hang out with people who uplift you rather than drag you down. Being around positive people enhances your life. When you have a positive attitude, you find that solutions come easily to you and things don’t get you down as easily. An attitude of gratitude emphasizes all the good things in your life. Taking the time to recall the things and people you are grateful for, helps you remember the positive aspects of your life. When the good things are frequently brought to mind, your life seems brighter. I do this exercise first thing in the morning and last thing at night – I think of 10 things I am grateful for that day and list them in my mind. If it has been a particularly challenging day, I might struggle with finding ten things; I have been known to count the fact that I can think of anything at all as one of the things I am thankful for! Choosing a positive attitude or being grateful for the good things in life doesn’t mean that you stick your head in the sand and ignore the challenges and problems of life. Choosing a good attitude simply helps you see the world through clear glasses rather than the foggy ones of negativity and despair. Good post Miss T! I like the old adage that life is 10% what happens to you and 90% how you react to it. Having a positive attitude, though difficult at times, generally makes life much better plus you’re a happier person to be around. I agree. I had some stuff going on a few years ago and when I changed my attitude I had much great capacity to cope with the issue. I am working on being more patient with people. There is a fine line between being understanding and letting people treat you like you are dumb though. Before I was fighting with everybody who wouldn’t do things my way, life is better with a bit of tolerance. I agree. There is a fine line. I am working on trying to be more understanding with my parents and patient with them but it sure isn’t easy. Starting your day right is a big one for me. If I get out of bed late and trip over dog toys and my youngests’ crayons, I’ll get annoyed. And I don’t have time to just relax and have breakfast, and so the whoel day is fricken shot. The start of the day is important for sure! Very true. I find that if my morning routine gets disrupted my whole day feels off. There are certain things I need to set out for the day. I am sure when I have kids I will need to adjust a bit. True! I once told a friend to change the way she deals with life because I often hear her whining. She spends her days telling people about her problems and no matter how good the situation is, she always had that sinking feeling that things are going to get bad. Eventually, she decided to change when I told her that she is attracting negative energy. After more than a year of doing her best to change, she was able to make her life better and her perspective of it clearer because she now says no to negativity and is able to look at her problems more objectively. That is great to hear. I am so glad your friend is doing better now. I had a similar situation with my friend when it came to relationships. I had her change her approach and outlook and now she is happy and engaged. And surround yourself with positive people! Agreed. I find this a big influence for me. The challenge is my parents. They are usually stressed and negative and having them around always feels stressful. It sure puts a strain on our relationship. I have a very positive attitude! I enjoy what I do as a career and have a great personal life. I have control over my life and can fix just about everything if I choose to. Therefore I should be very positive! Krant. I hope we call all say that about our lives in the future. I am not quite there yet but I am working on it. Glad you are doing so well. I know this sounds cheesy but I own a lot to having debt – I had to change my attitude to life in all its aspects completely to change my life. And it is paying off big time! I am glad you have seen such great benefits from making this change. It is that reinforcement that reminds us to have that good attitude. Good for you. That is all you can do and thinking positive is a much better way to spend your life. Remember, failure is how we learn what’s right. The older I get the more I realize the need to surround myself with people that have a positive attitude. I just don’t have time for the negativity any more. Me neither. I have actually stopped hanging around some people because they just brought me down. Fantastic post. Our perception and attitude determines how we live our lives. Thoughts are things that manifest themselves in our sub-conscious and if we feed it positive things it creates a positive feedback loop. You are so right Kevin. I have been working really hard on being more positive and I have seen it play out in my life even if I haven’t been conscious of it.